SAN FRANCISCO – June 12, 2012 – The Pygmies of Pocket God will soon jump from the screen of your iOS device and onto store shelves. Bolt Creative, developer of the Pocket God franchise, has today announced a deal with Funko to create vinyl figurine and plushy versions of the ever-popular and never-dying Pygmies. These new lines of Pocket God merchandise is expected to hit stores this September. 5-inch Collector Vinyl Figurines – These game-accurate figurines will be available in four different Pygmy styles: Happy Pygmy, Warrior Pygmy, Zombie Pgymy, and the Moon Witch. 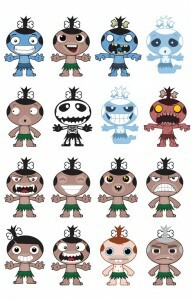 Stylized Plushies – These stylized and stuffed Pygmies will come in the same four styles as the Collector Vinyl Figurines. 2.5-inch Blind Box Figurines – These smaller vinyl figurines will come in 16 unique characters of varying rarity. Each figurine will be packaged in an art collector blind box – fans will not know which Pygmy they’ll get until they open them! Starting out on the iPhone in 2009, Pocket God has since had hyper growth with multiple games and onto other platforms including all iOS devices, Android, and social. The franchise also includes a wildly successful digital comic series. For more information please visit www.boltcreative.com and www.funko.com. Bolt Creative is a San Francisco-based developer and publisher of original games, including the hit iOS phenomenon Pocket God, ranked by Apple as the #9 Top Paid App of All Time. Since its 2009 launch, Pocket God has mushroomed into a full franchise with the original game hitting multiple online and mobile platforms, Pocket God: Journey to Uranus bringing players and pygmies into outer space, and Pocket God: The Runs hitting iOS in the spring of 2012. The digital Pocket God Comics series has become one of the most successful digital comic series available and continuously outperforms megabrands. 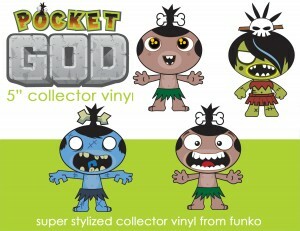 Fans can also purchase Pocket God merchandise such as figurines, apparel, and plush. Bolt Creative’s goal is to develop games that crack them up and entertain players for countless hours. For more information, please visit www.boltcreative.com. Funko, located in Seattle, Washington, has been producing pop! culture licensed items for over 12 years. Funko is the leading bobble-head company in the world with distribution in Japan, Europe, Latin America, Australia and North America. In addition, Funko produces Plush, Vinyl and Action Figures and licensed Electronics.